Haitian Art by Wilfrid Teleon. Wilfrid Teleon was born in Cap Haitien in 1958. At the age of nine, he lost his right arm when he was pinned against a wall by a runaway truck. Many of the people in his paintings have one or both arms outstretched and sometimes there is a one -armed male in the scene. He began painting in 1980 when he joined the the art co-op "Arc-en-Ciel", which was founded by the painters Laetitia Schutt and Max Gerbier. Wilfrid was a sociable person, involved with the theater and with other musical and cultural pursuits. 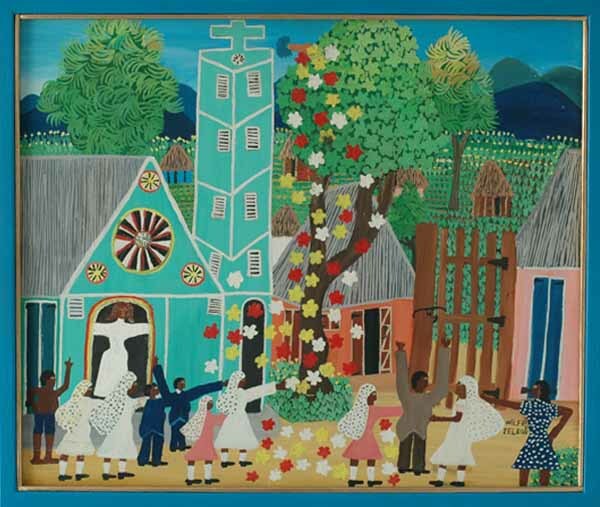 His paintings depict the everyday life of Cap Haitien and the best ones contain a surreal spiritual element, perhaps an angel floating above the coffin in a Cap Haitien funeral or the hand of God showering flowers on First Communicants as they leave the church. His work was shown in the exhibit "Dialogue du Reel et de L'Imaginaire" in Strasbourg, France, in 1990 and appears in the book of the same name. A painting of his graced the calling card of the French Ambassador's wife in the late 1980's. Wilfrid was a self-taught painter who worked in relative obscurity; Not many people have seen his work. When the tale is told he will be considered an important naif. Sadly, he died prematurely of an incurable disease in October 1992. Visa, Mastercard, American Express and Discover cards are cheerfully accepted. To visit the Wilfrid Teleon Archive, click here. Archive paintings are not for sale.